Not a fan of MSN Messenger? don't want Windows Media Player on your system? Fair enough, but if you go to Add/Remove Programs in the Control Panel, by default none of Windows XP's 'built in' programs are visible. 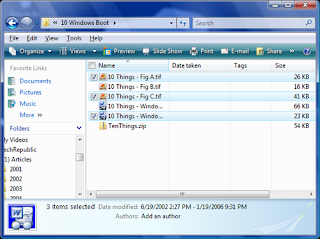 it's fairly easy to change, though... just open the file X:\Windows\inf\sysoc.inf (where X: is the drive letter where Windows XP is installed) in Notepad. You should see a section of the file something like this: [Components] NtComponents=ntoc.dll,NtOcSetupProc,,4 WBEM=ocgen.dll,OcEntry,wbemoc.inf,hide,7 Display=desk.cpl,DisplayOcSetupProc,,7 Fax=fxsocm.dll,FaxOcmSetupProc,fxsocm.inf,,7 NetOC=netoc.dll,NetOcSetupProc,netoc.inf,,7 iis=iis.dll,OcEntry,iis.inf,,7 com=comsetup.dll,OcEntry,comnt5.inf,hide,7 dtc=msdtcstp.dll,OcEntry,dtcnt5.inf,hide,7 IndexSrv_System = setupqry.dll,IndexSrv,setupqry.inf,,7 TerminalServer=TsOc.dll, HydraOc, TsOc.inf,hide,2 msmq=msmqocm.dll,MsmqOcm,msmqocm.inf,,6 ims=imsinsnt.dll,OcEntry,ims.inf,,7 fp_extensions=fp40ext.dll,FrontPage4Extensions,fp40ext.inf,,7 AutoUpdate=ocgen.dll,OcEntry,au.inf,hide,7 msmsgs=msgrocm.dll,OcEntry,msmsgs.inf,hide,7 RootAutoUpdate=ocgen.dll,OcEntry,rootau.inf,,7 IEAccess=ocgen.dll,OcEntry,ieaccess.inf,,7 This is a list of all components installed at the moment. I've taken the example of MSN Messenger - the program entry called 'msmsgs', third-last line. You can see the word 'hide' highlighted - this is the string which tells Windows not to display the component in the Add/Remove Programs list. Fix this up by simply deleting the word 'hide' like so: msmsgs=msgrocm.dll,OcEntry,msmsgs.inf,hide,7 To this: msmsgs=msgrocm.dll,OcEntry,msmsgs.inf,,7 Now, after restarting, you should be able to see MSN Messenger in the Add/Remove Programs list. If you want to be able to quickly view and remove all components, simply open the sysoc.inf file and do a global find and replace for the word ",hide" and replace it with a single comma ",".